When I was home at Christmas, we went to my brother and sister in-law’s home for a party. We ate dinner, competed in a sugar cookie decorating contest, sang Christmas carols, and caped the night off with hot chocolate and biscotti. It was very fun and festive. My parents brought two kinds of biscotti: anise and orange. 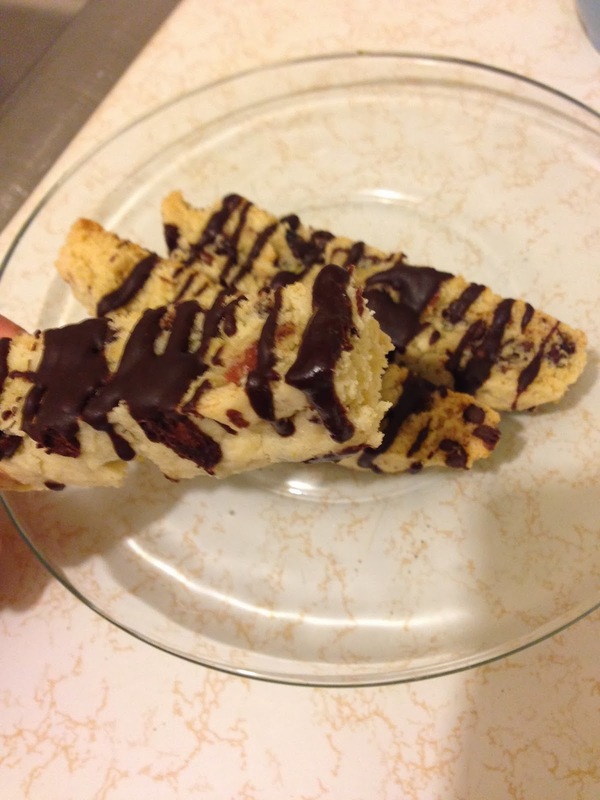 My sister in-law made bacon chocolate chip biscotti. I ate several of each and thought they were all wonderful. I’m not sure if this is the recipe my sister in-law used, but it tastes the same. She sprinkled sea salt on hers for a little extra flavor and crunch. Biscotti originated in Prato, Italy. The name originated with a Medieval latin work that means twice baked. Biscotti has been made and enjoyed for centuries. The English work biscuit came from biscotti, though the meaning is not the same. The ingredients are 4 to 6 slices cooked bacon, ½ cup butter, 1 cup sugar, 2 eggs, 1-tablespoon vanilla extract, 2 ½ cups all-purpose flour, 1 tablespoon baking powder, ¼ teaspoon salt, and ½ cup mini chocolate chips. 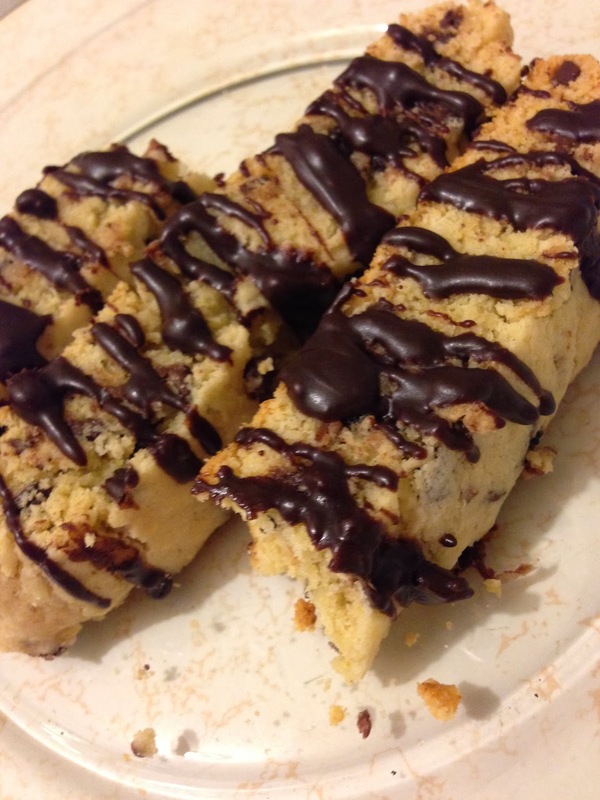 I drizzled some melted chocolate chips with a little milk on top of the biscotti to make them more decorative and tasty. I beat the eggs and vanilla extract into the butter mixture. I added the flour, baking powder, and salt. I stirred. Before it was combined, I added the coarsely chopped bacon and chocolate chips. I finished combining all the ingredients. I split the dough into two lumps and formed the lumps into two logs. The recipe suggests the logs should be two by twelve inches in diameter. Mine were more like three by eight inches in diameter. I placed the logs two to three inches apart on a parchment lined baking sheet. I baked the cookies at 350 degrees Fahrenheit for 25 minutes. I let the logs cool for 10 minutes and lowered the oven temperature to 300 degrees Fahrenheit. I used a serrated knife to cut the logs into half-inch segments. I laid the segments on the parchment lined cookie sheet and baked for 16 minutes. Half way through the cooking time, I flipped the biscotti over to dry the other side. I let the cookies cool, and then drizzled them with melted chocolate. These are outstanding. The little crunchy, savory bits of bacon in these sweet biscotti were tremendous. I give this recipe two enthusiastic thumbs up.